The three musicians each hold classical performance degrees from some of the most venerated schools in the world: Indiana University, Oberlin, Eastman School of Music. But their classical background is only one dimension of this trio’s powerful musical voice. 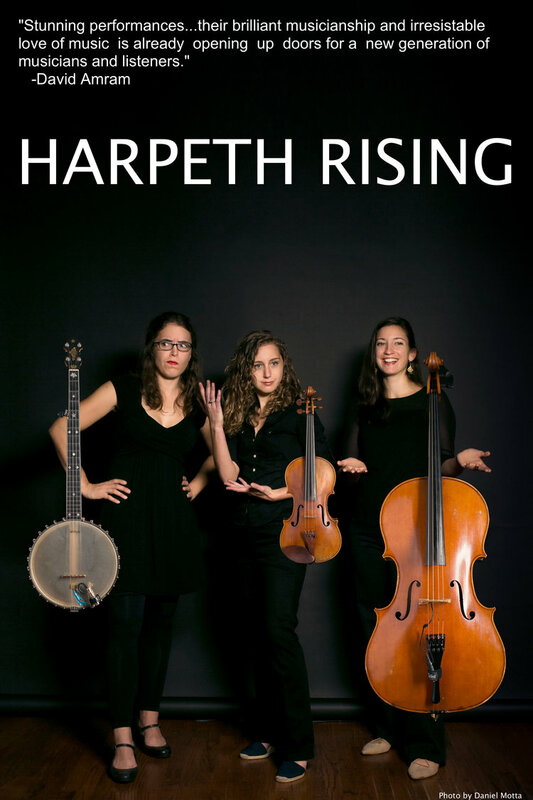 Hailing from vastly different parts of North America, each member of Harpeth Rising brings different influences to the core sound. Maria Di Meglio, cello, was born and raised in Brooklyn, NY. She was drawn to the music of her first generation Italian and Balkan roots, and grew up learning Eastern European folk songs alongside classical repertoire. She attended many classical programs throughout NYC, including LaGuardia High School (the “Fame” school), and Manhattan School of Music’s Precollege Division. Michelle Younger of Charlottesville, VA comes by her modern spin on old-time infused banjo authentically; her family has been in the United States for generations, and she is a descendent of Cole Younger, a member of the James-Younger Gang and the namesame of his very own banjo tune. Jordana Greenberg, violin, grew up listening to the sounds of Stan Rogers, Leonard Cohen and Natalie McMaster in her native Canada before moving to Southern Indiana as a child. She studied classical violin by day through the pre-college program at Indiana University, and spent her nights learning the folk tunes and classic rocks songs that her family plays at the annual post-Passover jam session. Against All Tides, Harpeth Rising’s sophomore album as a trio, is proof that authenticity and complexity can live in harmony. It is an exploration of spirituality in place of fundamentalism, uncertainty as philosophy, and an unwavering declaration that human connection is the ultimate force for good in the universe. The songs, crafted lyrically by Jordana Greenberg and arranged by all three members of the trio – Maria Di Meglio, Michelle Younger and Greenberg – do not intend to distract from the social and political atmosphere. They are the vehicle by which the band has chosen to add their voices to the ongoing fight for understanding and respect. Two sets of lyrics – tracks 6 and 7 – come from David Greenberg, Jordana’s father, who has contributed work to every album the band has recorded, and who continues to be a source of inspiration. Track 8 is a cover of a Joan Baez song, – an indictment of the prison system and immigration laws – which heartbreakingly has fully retained its relevance in the 45 years since it was written. Advance ticket sales for this event have ended. All tickets purchased on the day of the event are $25. Tickets will be available at the performance venue.